Evidently the “S” in iPhone 4S stands for sales. 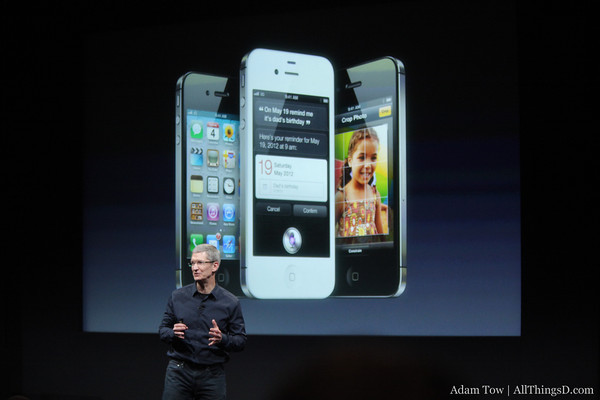 Overwhelming demand for Apple’s new iPhone 4S during the first weekend of preorders has sent unit sales for the device skyrocketing. Apple sold more than one million in the first 24 hours the handset was on sale — a new record, according to a statement released by the company. Indeed, AT&T received more than 200,000 requests for the iPhone 4S in the first 12 hours of availability for preorder on Friday, surpassing even record demand for the iPhone 4 last year. Though the iPhone 4S officially goes on sale on Oct. 14, shipping times on Apple’s Web site have already shifted to “one to two weeks,” or as late as Oct. 23. Impressive. By comparison, Apple sold 1.7 million iPhone 4 units during the device’s first three days at market in 2010, and one million 3GS phones during the same period; back then, it sold 600,000 during the first 24 hours.